I'm not sure if you have ever experienced Japanese Hibachi style cooking, but one of our favorite restaurants in the Berkshires is Shiro Sushi & Hibachi Japanese Restaurant in Great Barrington, MA. The food is fabulous and watching the Chef prepare your meal right in front of you adds a little something extra. And let's not forget the fact that your food is served fresh and without a doubt, hot. There were five of us in our party, with an early reservation for 6PM. Once seated, our waiter was prompt in greeting us and taking our cocktail order. Our picks ranged from Sake to Sapporo, with a white wine drinker in the group as well. We started with a Spicy Tuna Roll, Avocado Roll and a Spicy California Roll, which were excellent. We decided to give the the Hibachi Chef a bit of a test, by each ordering a different entree. For our entrees we ordered the Hibachi Chicken, Hibachi Sirloin Steak, Hibachi Scallops, Hibachi Sirloin & Chicken and Hibachi Seafood Combo. Each dinner included a Japanese onion soup, garden salad, grilled vegetables, fried rice and sautéed noodles. The soup was served hot in a decorative bowl, with a traditional Japanese soup spoon. At this point the Hibachi Chef wheeled his food cart to our table area, "tooting" a horn that he had on the cart, announcing his arrival. A great ice breaker and a nice added touch. While we watched him prepare the grill for cooking, our waiter returned with our salads. The salads are served with a "house dressing" which is unique, yet actually quite good. With initial fire show over and the grill now ready, the Chef began breaking eggs, five in total, onto the grill using a variety of techniques. Here I am, thinking there is only one way to crack an egg ...I guess I was wrong. Once the eggs were cooking he removed the first tray from his cart which contained cooked rice on one side and noodles on the other. He added the rice to the grill and finished it using a variety of ingredients from his cart. After mixing the eggs into the rice, the Chef shaped the fried rice neatly then divided it into five serving and immediately placed a serving on each dinner plate before us. Next he prepared the sautéed noodles, while we were enjoying the freshly cooked fried rice. As with the fried rice, the portion size of the noodles with far from small. After cleaning and preparing the grill once again, the Chef took the next tray from his cart, which contained a large amount of vegetables which he began grilling. Off the side, he created the traditional Hibachi Volcano Onion, which is always a crowd pleaser, especially for the children. The onion was then chopped and added to the vegetables to finish cooking. I would like to mention that our Chef was excellent and that he tried hard to make us a part of the cooking process, was fun and entertaining. With the vegetables grilling, the Chef then began adding the scallops, lobster tail, steak, chicken and shrimp to the remainder of the grill. As he added garlic and various seasonings to the different entrees, our table area came to life with a medley of amazing aromas. With ease the Chef cut the sirloin steaks and chicken breasts into bite size pieces, hinting to us that the meats were indeed tender. He then removed the lobster tail from its shell and finished grilling it to perfection, before cutting it as well. Lastly, he turned the sea scallops over to finish them to perfection and began serving everyone their entrees. After serving the scallops, he cleaned his grill and returned to the kitchen, only to return a few minutes later for a repeat performance, at another table to our left. Our overall experience that evening was excellent. From service to food, we had a great time and we will be back soon. I would also like to mention the amount of food we were served was great and in fact, two members in our party left with lunch for the next day. If you have never been to Shiro Sushi & Hibachi, I strongly suggest you try it, but recommend calling ahead for a reservation, if you are planning to experience Hibachi. 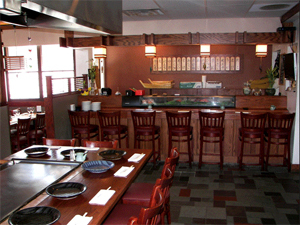 In addition to their three Hibachi tables, they also have a nice dining area, serving a full menu, as well as a Sushi bar.